23 cm xii, 1420 p. : ill. Previous ed. : Indianapolis, Ind. : Sams, 2004. 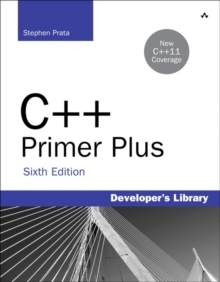 C++ Primer Plus, Sixth Edition New C++11 Coverage C++ Primer Plus is a carefully crafted, complete tutorial on one of the most significant and widely used programming languages today. An accessible and easy-to-use self-study guide, this book is appropriate for both serious students of programming as well as developers already proficient in other languages. The sixth edition of C++ Primer Plus has been updated and expanded to cover the latest developments in C++, including a detailed look at the new C++11 standard. Author and educator Stephen Prata has created an introduction to C++ that is instructive, clear, and insightful. Fundamental programming concepts are explained along with details of the C++ language. Many short, practical examples illustrate just one or two concepts at a time, encouraging readers to master new topics by immediately putting them to use.